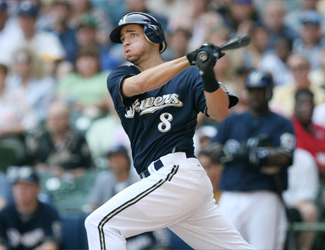 Ryan Braun and Prince Fielder both homered as they backed up Zach Grienke against the St. Louis on Sunday afternoon. The Brew Crew took game 1 of the NLCS with a score of 9-6. Ryan Braun homered in the first to put Milwaukee on top but David Freese put St. Louis back on top with a three-run shot. Fielder then tomahawked a fastball over the right field wall and put the Brewers up for good. Edwin Jackson will take on the Brewer's Shawn Marcum tomorrow night.